We decided to stay home for the weekend, instead of our usual stint visiting the coast. What is a girl to do with 4 whole days? I was hanging out some washing, always a good start to feeling organised and on top of things. I had hung the clothes out, the sun was warm, and for the first time this year all 3 children were in the sandpit. The dog too. Digging for treasure they buried for her. There were an assortment of exploding volcanoes, sand pies, and then things took a turn for the worse. T-shirts were stuffed with wet sand, laughter erupting around me. Then came the hose, spraying walls, dogs, kids. Then the sand throwing. Everywhere. I was aware all of this was happening around me, and was happy in my bubble of bliss while the blood curdling shrieks of three small people were spirited and happy – and the sand wasn’t landing in my mouth, the world was fine. Bleeding eyeballs and tears were the only thing that could bring me out of my trance. While all this was happening around me. I had found a stumpy purple pencil at my feet (I cannot stand purple, I adore violets – but the colour is always the last I would choose in a line-up of the rainbow.) I had picked up this pencil and started drawing on the wall of the house. 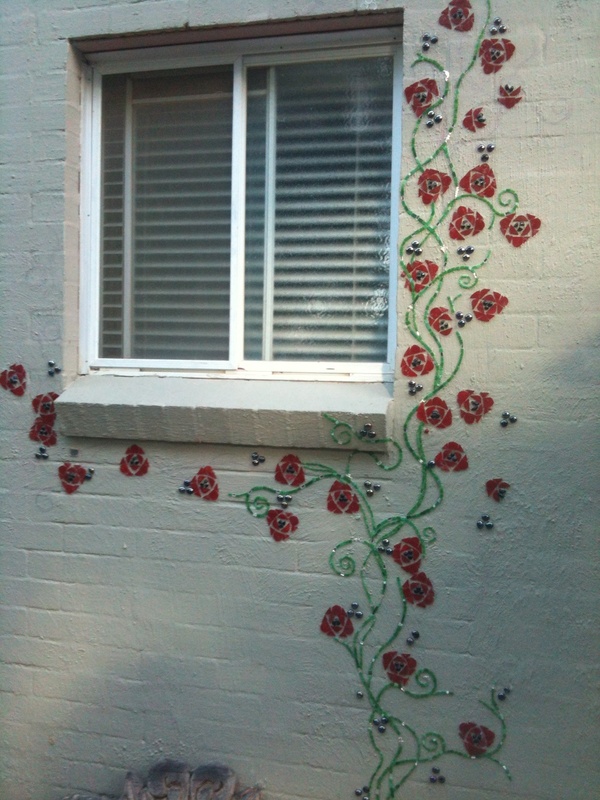 Swirly lines, flowers, a vine of sorts in a deco style. I love my deco. The noise around me still loud with laughter. A good sign. I grabbed my nippers. I started cutting little green pieces of glass for the stem. Bits of mirror too – because we all know I love sparkle. I glued over the purple line. Two hours had passed with no child related incident. 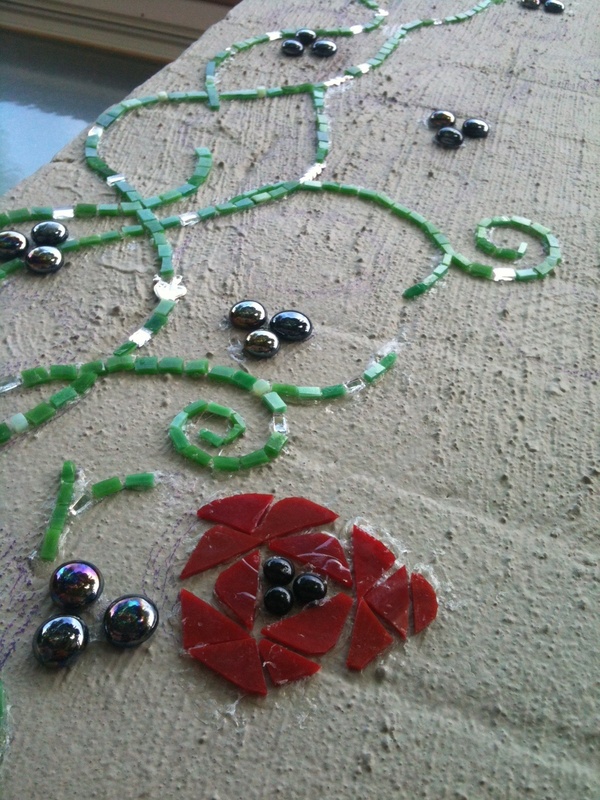 In fact the smallest one had joined me and asked if he could stick the green bits, green is his very favourite colour. Terrific, I had a personal assistant for my project! He stuck around for at least two hours. The vine was nearly done. 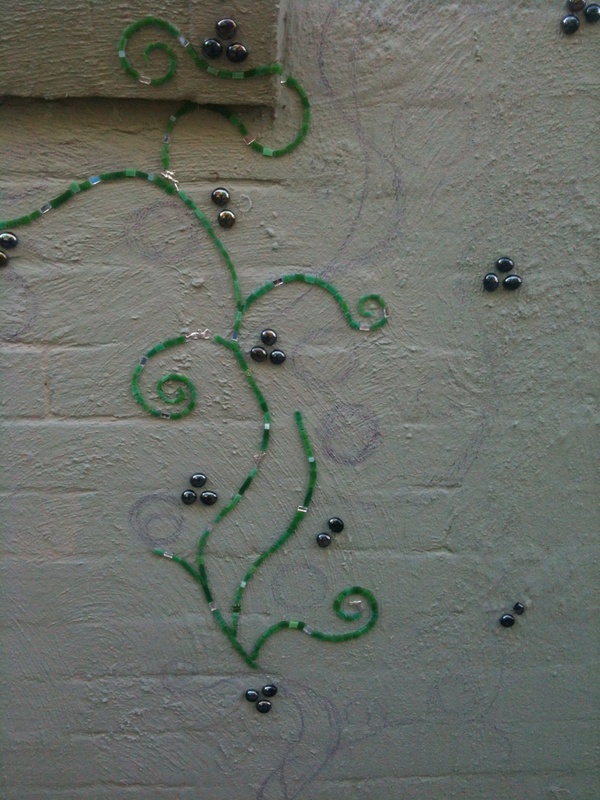 Then we started on the flowers. He stuck on all of the flower stamen within reach. One. Two. Three. Then the inner petals. Then he cut and run, he went for a bath. I carried on over the next few days with eager assistants, until the sun went down. as relaxing as floating on my back down the river. my planning skills are severely lacking as any friend will tell you. Picking glue off my fingers has always a moment of pure zen for me. Flying by the seat of my pants has always been my mode of transport. I had sand, I had water, I had squealing around me – and look what happened. I remember my early fascination with bevelled edged mirrors. There was a giant one on the wall at my grandparents house, a sweet country town famous for its cheese. The mirror seemed enormous to me, and I wasn’t entirely sure it wasn’t the old back window from my Pop’s EK Holden, treated with silver paint. I belonged in a house with an artist mother and conservative/gardening father. They had their own taste, and bevelled edged mirrors didn’t have a place in our childhood home. They were decorating in the seventies, with huge colourful printed curtains (in hot pink, red and orange), sculptures, paintings bought from galleries, and huge carved elephants brought from Southern Asia. I believe sheepskin may have been peaking at this time too. My grandparents died, and the Great-aunts did too. I don’t know where everything went. The mirrors, the aluminium canisters, the heavy club lounges, the chenille bed spreads… Everything did go, probably to the dump or Second Hand shops in the little town. Anyway, I grew up, left home. I moved to Sydney. I only knew a handful of people. I had to find a new way to spend my weekends. I found Second Hand shopping. I was amazed at what I discovered. My love of treasure hunting soon overtook my weekends. I found a sweet small mirror with bevelled edges. I was naturally drawn to it, without explanation. Then came more. One by one. Its not about admiring my own reflection, nothing to do with vanity. I do love the way they reflect my garden. Bringing the outside in. Along with bevelled edged mirrors, I collect any lovely piece that ‘speaks’ to me. Old wardrobe doors with brass handles, make lovely full length mirrors. Eighteen years later, and five homes later, they keep finding me. Garage sales at little coastal towns. Charity shops in my city. Birthday gifts from people who know me well. A lady at a little town Antique shop keeps them aside for me. Now I have…many. So, what is responsible for this, may I ask? I’m not sure. But I love these stairs. I love mirror, I like shiny things. I still have 2 steps left to glue – and wee bits to touch up.